ADDENDUM and APOLOGIES: In my haste to post I inadvertently omitted the names of two people who played critical roles in creating the interest that led to bringing Imagination Library to Springfield. 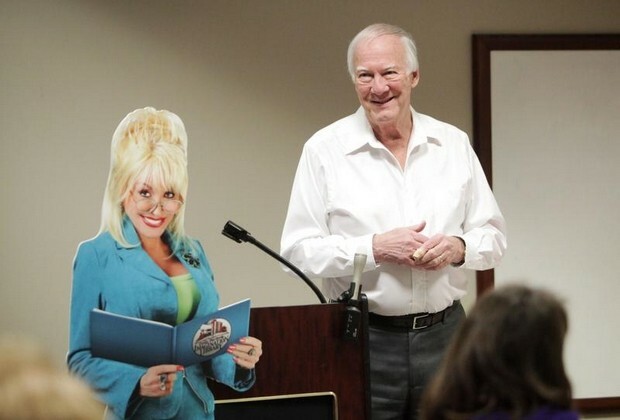 Peter Herschend was there to speak on behalf of Dolly Parton’s work and his own belief in its importance, and Pam Hunsaker, Regional Director of Imagination Library programs, was there to explain the program and respond to questions. Without their valuable contributions, we might never have gotten off the ground! Naw, that’s not the real Dolly Parton. But Imagination Library was her idea. Children of parents who register for the free program receive a new book each month until they reach their fifth birthday. I had the pleasure of getting the program started in Springfield and so far we’re serving slightly more than 2,000 children in selected zip code areas of the community. By getting it started I mean I brought together a group of like-minded people and organizations to talk about the Parton program. The United Way agreed to take it on to bring to the public and the Springfield-Greene County Library District agreed to provide expertise, record keeping, and leadership. Others joined the fledgling group, including the folks at Dixie Stampede in Branson, Missouri. We meet monthly to review and plan. One topic on every agenda is money. Although Dolly Parton’s people make it as easy as possible to place books into the hands of youngsters under five, each community that accepts her challenge is charged with raising the $25 per child per year it costs. Although we’re up to 2,000 children per month now (25 x 2,000 = 50,000/year), there are 9,000 children in our community and closer to 16,000 county-wide. We’ve come a long way but have a long way to go. This October 19 at Highland Springs Golf Course, near Springfield, Missouri, Imagination Library is trying something we haven’t tackled before. Thanks to the brainstorm of team member Michelle Herschend, we’re holding a charity golf tournament to raise funds to support our program. Click here for the information. 2015ImaginationLibraryGolfREG If you or anyone you know might be interested in entering the tournament and/or supporting it at some level, I hope you’ll share this information. Many families don’t have books for their small children, who sit in front of a television instead of hearing literature read to them during their crucial first five years of development. Kids get excited when a book addressed to them arrives in the mail each month. They can’t wait to have someone read to them. Being read to at home on a regular basis lays the groundwork for later success in school. Dolly Parton understands this and her program has now become established across America. So far more than 70 million books have been mailed to homes where delighted young children live. So wish us luck come October. We hope to raise a significant amount of money that will help us maintain progress so far and further extend our reach into additional homes.